Samuel Stanhope Smith, salutatorian of the Class of 1769, was the first alumnus of the College to become its president. After graduation, Smith became a teacher and preacher in Virginia and took a leading part in the founding of the two academies that became Hampden-Sydney College and Washington and Lee University. Through sermons and writings, he helped pave the way for the “separation of church and state,” a radical doctrine then being advanced by his fellow Princetonian, James Madison, Class of 1771. Smith returned to Princeton as professor of moral philosophy and as President Witherspoon’s son-in-law. Fifteen years later, when Witherspoon died, he succeeded him. During his presidency Smith increased his reputation as a scholar. Elected to the American Philosophical Society, he delivered “An Essay on the Causes of the Variety of Complexion and Figure in the Human Species,” in which he argued that all mankind belongs to the same family, and that diversity within the species should be attributed to environmental influences. He firmly believed in the compatibility of science and religion. Smith promoted the study of science and modern languages, without challenging the place of classical languages and literature, as disciplines important to training for the ministry. His early appointments to the faculty included John Maclean, the first professor of chemistry to teach on a college campus in the United States. 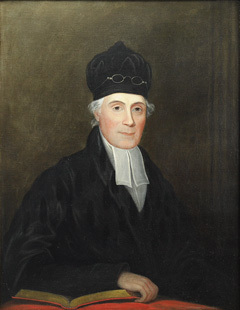 Samuel Stanhope Smith (1750–1819), Class of 1769.